This beautiful painting was produced around the time of the end of the great Safavid Dynasty in Iran. The Safavids had declined politically during the 1600s, but their patronage of the arts continued through the end of their dynasty. It was a period of increased contact with Western art. 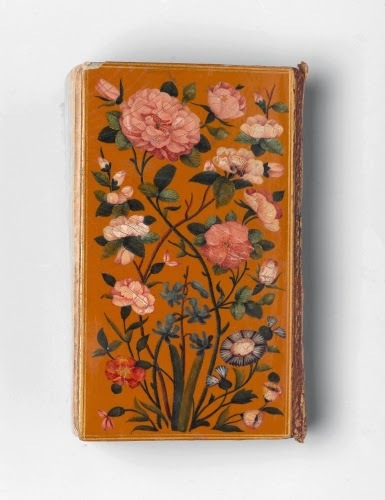 Although the realism of this prayerbook cover may be reminiscent of the border designs in European manuscripts of the Renaissance period, the motif had a long-standing tradition in Iranian art with the Muslim tendency to avoid the human figure in religious art works. The great tradition of landscape painting that had matured firmly during the Song Dynasty (960–1279 CE) in China, and transmitted to Korea and Japan, has endured in Japan to the present day. Ko Fuyo, the son of a doctor in Kyoto, studied Confucianism and seal carving. Although he was more renowned for carving seals in wood and lacquer, his landscape paintings were praised for their faithful translation of the Ming Dynasty (1368–1644) style. He modeled many of his compositions after famous painters of that period and even changed his name to the Chinese “Gao,” which is “Ko” in Japanese. The 1700s in Japan was the period when woodblock prints reached their high point in production and variety of subject matter. 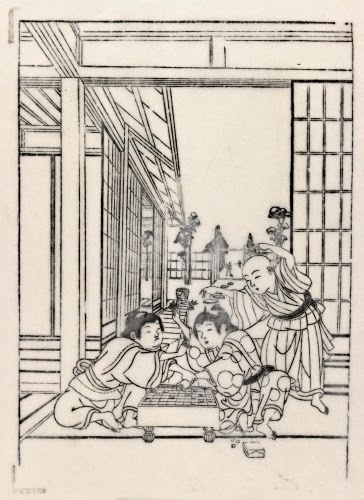 Genre subjects (scenes of everyday life) were very popular, made so by artists such as Suzuki Harunobu (1725–1770) and Kitagawa Utamaro (1753–1806). Western ideas such as one-point perspective creeped into the Ukiyo-e style during the 1700s, seen in this print. Shogi is the Japanese version of International Chess, with slight differences in the rules. The Edo Culture of Benin endured until the British invaded and dominated Nigeria. Art from Nigeria and other African countries was exported to Europe starting in the 1890s. Lost-wax metal casting evolved for the Edo at the same time it did for the neighboring Yoruba and Ife cultures. 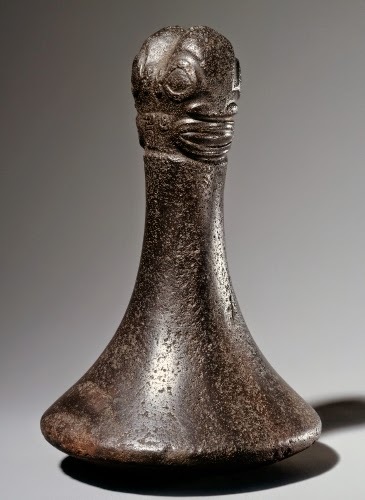 Realistic figurative sculpture may have been influenced by art from the Nok culture, which flourished in Nigeria ca. 500 BCE–100s CE. Heads of rulers such as this were commissioned by their heirs. 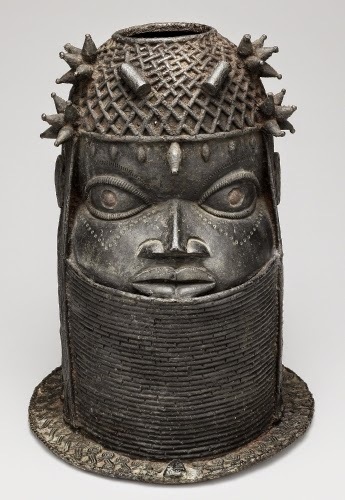 The heads were placed in an honored spot in the palace, where they were symbolic of the continued presence and aid of past rulers in governing the Edo. Around the first century BCE, the Marquesas Islands were populated by Polynesian islanders from farther east. By the 1400s, every region of the islands was populated. The Marquesans lived in isolation from the rest of the world until the messy, albeit brief, Spanish “visit” in the late 1500s. This food pounder dates from the last period before the Marquesans were almost wiped out by Western diseases after the French occupation of the 1800s. In every aspect of Marquesan life, tools and utilitarian objects were decorated by anthropomorphic forms, similar to what is seen in some African cultures. Hinduism formed ca. 1500–1300 BCE according to archeologists, when Aryan cultures from inner Asia mixed with the urban cultures of the Indus Valley, a region that included Nepal. Examples of Hindu paintings on cloth that decorated temples on high religious days are extant now only in Nepal. 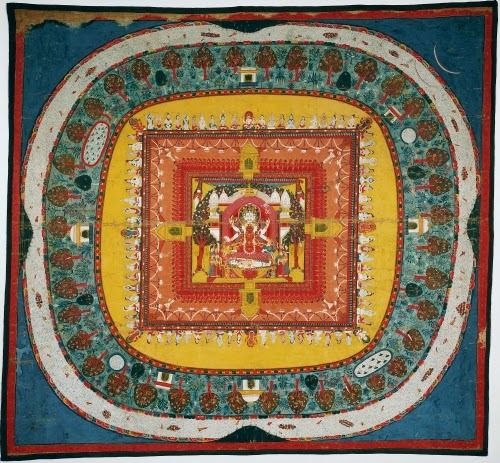 Mandalas are basically diagrams of the cosmos containing all of the celestial forces. Siva, masculine, is the symbol of consciousness, while Shakti/Parvati, feminine, is the symbol of energizing, activating power. 1700s, after the Spanish retook control of the Southwest from the Pueblo uprising (1696), pottery of many of the Pueblo cultures evolved in ways both stylistic and technical. Lead glazes were abandoned in favor mineral-based pigments, new decorative motifs evolved, and many new vessel shapes appeared. 1700s was the period of Chinese ceramic production for export most appreciated by Western collectors, especially cobalt blue and white wares. 1700s porcelain factories were established in Germany, France, and Britain. In Britain, porcelain is called “China,” for obvious reasons. ca. 1750 to 1776, the golden age of American painting before the revolution (primarily portrait painting), with activity by both native and British expatriate artists. ca. 1716 and 1736, Kyôhô Reforms, the eased restrictions on Western imports in Japan. An influx of books, treatises, and prints of Western art that concerned primarily landscape painting were eagerly consumed by Japanese artists. Late 1700s, after a series of rebellions by native Peruvians, the Spanish government destroyed any artwork that depicted indigenous culture or history. 1739 Iranians sack Delhi, all but ending Mughal power in India. Islamic culture and painting persist in India to present day.